Here are some practical elements of backyard chicken care for those of you wavering towards thinking it might be a good idea. There are plenty of chicken books to choose from. My favorite one was a book I “borrowed” from my grandparents, now defaulted to a permanent loan, called Encyclopedia of Organic Gardening: A complete guide to gardening without DDT or other poisons or chemicals edited by J.I. Rodale, a pioneer in the organic movement. I wanted to write out the full title just to show how far we have come since the book was published in 1959. DDT was banned in 1973. The book was republished in the 90s with a different title. What first piqued my interest in chickens was the assumption in that book that every gardener would have chickens to help with fertilization, aeration, and insect control. Whatever book you choose, the first part is checking with your city or municipal ordinance to find out what the rule are. Depending on your neighborhood, you might have to be a certain distance from a fence, get signed permission from your neighbors, or start a petition to get the law changed. With borrowed saws and air guns we were able to cobble together a very serviceable structure. Most people tell you to have about 3 square feet per chicken, and I will be good and not mention that is a lot more space than what chickens have in factory farms (I am being so good, not mentioning that.) 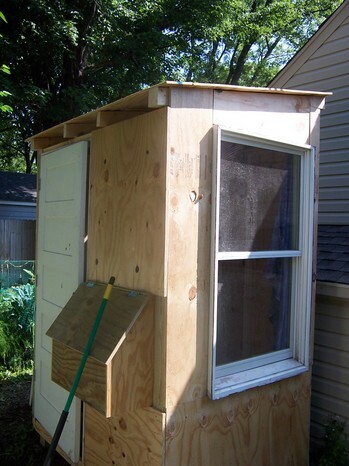 I had visions of raccoons creeping into the structure at night and dismembering our girls, so we have hooks that latch, a door with a key that locks it (those raccoons can be crafty), and a double layer of chicken wire at the top protecting our ventilation gaps. Once the girls got big enough to dig in the earth, we built a small run for them to be outside. By this time, I had heard horror stories of a raccoon eating a chicken through chicken wire, so I completely enclosed (top, sides, bottom) a small area with a double layer of chicken wire and plastic garden netting. After the girls became large enough to scare away our cat (and I had stopped worrying so much about raccoons during the day) we opened their door and let them roam in the garden that we had cordoned off with deer fencing. Now every morning, I open their door, they run outside squacking and flying directly to a row of conifers. Once it is clear there are no hawks about, they start aerating and fertilizing our fallow garden, just like J.I. Rondale said they would. The cost of the Eglu aside, I do think their model works well in that they will send you four chickens to go with your purchase of a home. Poultry hatcheries require you purchase 25 chicks at a time, which doesn’t work if you have a limit to the number of girls you can have. I was able to work around this by piggybacking my order with a friend who lives outside of town. That being said, there are classified ads of people selling their girls for one reason or another, Craig’s List is a good place to start. Also, since you are discussing this with six of your friends, perhaps you can share an order. With the deep litter method, large containers of water and feed that only need to be filled every 4-5 days, and a well built coop, the chickens are a lot easier than our dog and cat. We can leave them alone for a few days and they seem just fine. The only noticeable difference is the duration of the first flight as they emerge squawking and trumpeting from the coop to welcome us home. 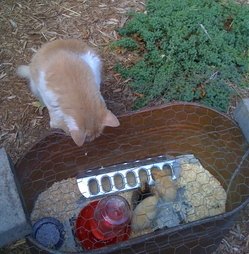 This entry was posted in On the Farm and tagged Backyard chickens, Corinna Borden, Real Time Farms. Bookmark the permalink. I have found that staking chicken wire flat on the ground around the outside of your run and putting up galvanized corrugated panels around the bottom of your runs fencing will keep almost any predator at bey except maybe a bear. I live in Northern Michigan and have a 10×10 coop and a run that’s 50×50. I put netting over the top of the run like a tee pee to keep hawks & falcons out. Chickens are the best at bug control while free ranging in the garden and that sure helps produce some whopper yolks in their eggs!